What a way to start the year! On February 1, 2018, I received the Microsoft MVP award for Office Servers and Services. The MVP award acknowledges technical and community leadership, and receiving it is a huge honor. Introducing me to incredibly smart people who have expanded my way of thinking, challenged my understanding and encouraged me to grow. Fostering relationships with people from all over the world. I’ve had the good fortune to meet and build friendships with so many members of this community. Many of these folks have become my chosen family and life simply wouldn’t be the same without them. Evolving my career path and personal brand. The mentorship and feedback I’ve received has helped me clarify my focus areas within SharePoint/Office 365 (e.g. user adoption, enterprise governance and ROI/business value) and supported me through several job changes. Giving me the opportunity to speak at conferences all over the world. For a travel lover like me, this is a true gift! Enabling me to give back and serve others. I’ve had the privilege of working on the SharePoint Saturday Twin Cities leadership team for the past 9 years, organizing 17+ local training events. These events enable people to connect, learn from experts and solve business challenges. THANK YOU, Microsoft, for the MVP recognition. And THANK YOU to all the friends in this community that have helped me on this journey. Every day my high school English teacher danced into the classroom (yes, she actually danced) and with all the theatrics of Shakespeare declared “I can’t believe they pay me to teach the classics!” I thought she was plum crazy. Even as a high school senior I knew you worked to live. You did not live for the opportunity to work. After 15+ years in the job market, I’ve softened my world view. If I won the lottery next week, I truly believe you’d still find me out here talking about SharePoint. Yes, I’d probably be talking about it part-time and on my terms. But things that interest me today–things that drive my passion, my curiosity and provide that feeling of accomplishment–will still be relevant and necessary, even if the monetary driver behind them ceases to exist. How can I be so sure? Because SharePoint provides a perfect intersect for me. It is the point at which my abilities, my interest and my agenda (or mission) converge. It serves as the hub or epicenter of my time, energy and focus. If you’re fortunate enough to find yourself working at such an intersection, you’ll find that you’re happier, more fulfilled and more productive. How do I know that SharePoint is a perfect intersect for me? Because I’m good at it, I love doing it and my organization needs it. It’s that simple. A few years ago I went through a team-building seminar. There was a bevy of small-group activities, feel-good moments, etc. One element that stuck with me, though, was the Venn diagram the facilitator drew on the board. She challenged all of us to hone in on a part of our jobs that we loved, that was critically important to the well-being of the company and that we were naturally skilled at. The message was clear: if you can find such an intersect, you should devote ALL your time, attention and energy to it. This is your perfect sweet spot. It is the area that provides you the most fulfillment and the company the most benefit. I love learning how to build solutions that reduce or eliminate the “soul-crushing, spirit destroying” work that people hate. Companies/organizations need these solutions. It improves their speed-to-market, reduces their overhead and helps them engage their employees at a higher level. We need a litmus test for jobs. It doesn’t need to be complex, but it needs to measure 3 critical elements: skill set, enthusiasm for the work and the driving business need it fulfills. The work should add direct value and positively impact the organization’s bottom line or strategic focus. But it should also hit a high note on your own personal “happy meter.” Think about it–how many jobs are essential to the business but fail to ignite someone’s passion? And how many people have things they’re passionate about doing, but fail to find an organization that views that work as essential? 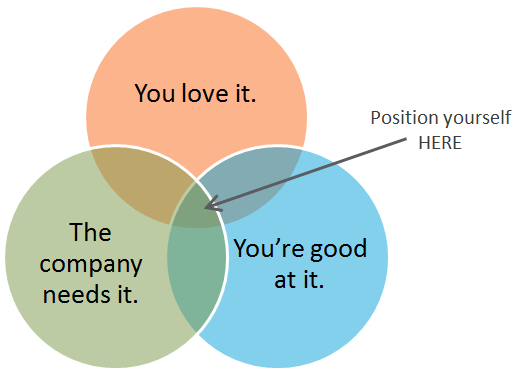 If you’re not in a job that’s nested within this intersect point, it’s time to do some soul searching. Can you make a business case for building your perfect role? Or is it time to move on? Every few months, someone approaches me at a conference and asks how I became a SharePoint speaker. I never know how to respond. It’s not that I mind the innocuous question; I just don’t think my evolution as a speaker is very interesting. As I stand there trying to form a pithy response to the “how did you get here” question, I get flooded with tactical follow-ups: How do you get on a conference agenda? How do you decide what to speak on? Where do you come up with your material? How do you get to travel around the world speaking at these events? And how can I do that? The logic behind the question makes sense. If you want to learn something new, a good way to start is building a couch-to-success plan. You find someone to emulate, learn how they succeeded, replicate their strategy (with a few tweaks if necessary) and voila! You succeed. Becoming a SharePoint speaker is hard–much harder, in fact, than it was just a few years ago. And there’s no magical methodology for success. So asking me how I became a SharePoint speaker is really the wrong question. The right question is much more personal–it is about you, the expertise you have, the story you can tell and the audience you are meant to connect with. I started attending local Twin Cities SharePoint events in 2008. At the time, many of the events and sessions were designed for technical audiences (IT Pro’s and Developers). I attended sessions and gleaned what I could, but quickly realized that I was not the target demographic. My goal wasn’t to learn all the technical aspects of supporting a robust SharePoint implementation. I wanted to learn how I could exploit SharePoint to make my business run faster. Was I interested in becoming more involved in my local SharePoint community? Yes. Was I interested in speaking at national events? Not really. My first priority was connecting. I wanted to find other SharePoint people who had the same burning questions I did about business valuations, information architecture and user adoption. I started small, applying to speak at a local SharePoint Camp. And I spoke about what I knew–how to implement SharePoint as a business automation tool and calculate its return on investment (ROI). People were excited to hear my story, and we connected. One presentation led to others and eventually I was asked to speak at the Best Practices Conference. I used my time at conferences wisely–connecting with others in the community and learning as much as I could. And yes, I was star-struck when I met many of the SharePoint gurus that I had conversed with over Twitter and followed on EndUserSharePoint.com. But I also saw what set SharePoint community leaders like Lori Gowin, Ruven Gotz, Cathy Dew, Laura Rogers, Dux Raymond Sy, Mark Miller, Bill English, Wes Preston and Virgil Carroll apart. Yes, they all were knowledgeable about SharePoint and were natural presenters. But they also had unique skills and knowledge sets. They focused in different specialty areas and supported one another. None of them took the same path to success, but they were all successful. The SharePoint community is a community. Relationships are important. And the best relationships are forged on curiosity, common questions and give-and-take learning. So if you’re interested in becoming a SharePoint speaker, go out in the community and connect with other SharePoint-ers. Attend a user group meeting. Ask a question. Volunteer to sit on a discussion panel. Invite a fellow attendee out to lunch so you can learn about their background and how they use SharePoint. Then expand your reach even farther–attend a regional SharePoint Saturday event and offer to work as a volunteer. Attend or organize a SharePint. Open a Twitter account and start following and tweeting other SharePoint-ers. If you’re a goal setter like me, you have a host of personal and professional objectives you’re striving to meet. Have you ever noticed, though, that the emotional high you get when you reach the finish line doesn’t last long? Yes, it feels great to finish what you’ve started…and you may take a few minutes to bask in glory of your accomplishment. But all too quickly you stop reveling and start mapping the next goal. I always assumed that that honeymoon feeling (the emotional high of success) was my propellant, what pushed me out of my comfort zone and towards fulfilling my goal. 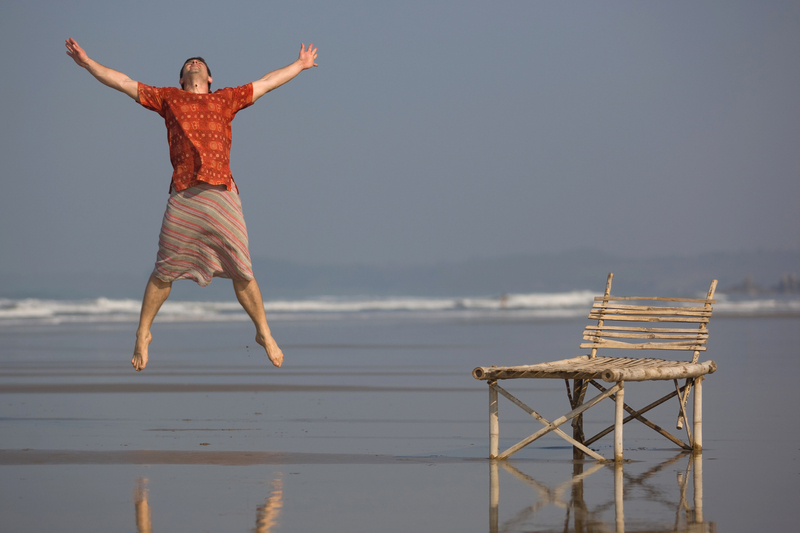 After watching Shawn Achor’s TED talk The happy secret to better work, I realized that the optimism and joy of the journey–not the fleeting euphoria of the finish line–spurs me forward. Happiness is not an aspirational state. And counter to popular thought, it’s not wholly dependent on external forces. As with many things, happiness is in the eyes (and the hands) of the beholder. Check out Shawn Achor’s video to see what I mean. 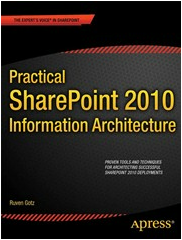 I’m incredibly excited about the publication of Ruven Gotz’s new book, Practical SharePoint 2010 Information Architecture. If you’ve been fortunate enough to see Ruven speak at a conference or SharePoint Saturday event before, you know he’s a whiz at explaining metadata, leading groups through mind mapping workshops and building out quick (but effective) wireframes. Now you can learn the details behind Ruven’s information architecture magic. He’ll walk you through the agenda and methodologies for his discovery workshops, introduce you to mind mapping and what it can do for your SharePoint projects AND explain the basics behind findability and putability, metadata and taxonomy, etc. Ruven was one of the first SharePoint experts I started following on Twitter. And when I got the chance to meet him at the 2009 Best Practices Conference, I was elated. From the get-go, Ruven and I shared a common information architecture world view. We believe in the power of analyzing content, involving end-users in the requirements gathering process and leveraging SharePoint as a case for effective change management. After some discussion, I opted to focus my chapter on The Art of Creating Business Process Solutions. This chapter provides a holistic view of SharePoint as a business process re-engineering tool. It outlines the “universal truths” that will help you relate to your business users, exposes the “forgotten layer of content management” that exists at most organizations, guides you through the search for your alpha project and describes how you can measure the Return On Investment (ROI) of your new solutions. Consider it a “couch-to-success” plan for building effective business process solutions. I’m incredibly proud to be a part of this book. For more information on the book, author bios, reader reviews, etc., check us out on Amazon. And don’t forget to visit the book’s Facebook page at https://www.facebook.com/PracticalSPIA. If you are feeling burned out and overwhelmed, it may be a sign that you’re trying to be too productive. I’m a tough sell. I’m not into self-help books, don’t watch Dr. Oz, and am generally not looking for unsolicited how-to advice on starting a business, getting on-the-job training or fixing my personal relationships. You can call me reticent or jaded, but I’m not easily moved by the average how-to guide. That’s what makes this blog post unusual. Rather than sharing a specific SharePoint solution or talking about how to calculate your Return On Investment (ROI), I’m dedicating this blog post to a truly inspirational book. So read this blog post. And then go pick up a copy of Anything You Want by Derek Sivers (ISBN 978-1-936719-11-2). To be fair, I’ve been a Derek Sivers fan for a while. I referenced his “Obvious to you. Amazing to others” video in my Easy. Obvious, even. blog post last fall, and have been meaning to read Anything You Want since then. Let me start off by saying that this is not a SharePoint book. It’s a compilation of thoughts, ideas and key learnings from the conception, launch, operation and eventual sale of CD Baby. (If you’re not familiar, CD Baby is the single largest web-based seller of independent music. Derek Sivers founded CD Baby as a hobby and grew it to become a $100 million business before selling it in 2008.) Sivers’ experiences with CD Baby are universal, though. In many ways, Anything You Want is the story of how a hobby reached the tipping point–the point when it gained its own momentum and became a product of its enthusiasts. Isn’t this, after all, what many SharePoint enthusiasts and coaches are after? Aren’t we trying to convince our business users of SharePoint’s inherent value and working to build momentum for this platform we all believe can make a critical difference in the way people work together? “Never forget that absolutely everything you do is for your customers” (page 15). This may sound obvious, but it’s amazing how often we fail to adhere to this basic tenet of customer service. And Sivers’ focus on customer service has a twist. He encourages focusing all your efforts on your current customers. If you thrill them, they’ll spread the word on your behalf, attracting more new customers than you ever could (page 15). Those of you that have seen my presentations know that I often contrast SharePoint with online knowledge bases. While I’m a librarian at heart, I recognize that online knowledge bases are, at their core, never-ending holes of need. No matter how much care and feeding you give them, they will always require emotional propping and vast amounts of evangelism and marketing. SharePoint is just the opposite. If you build compelling SharePoint sites that improve your users’ work lives, SharePoint will market itself. No emotional propping required. “Have the confidence to know that when your target 1 percent hears you excluding the other 99 percent, the people in that 1 percent will come to you because you’ve shown how much you value them” (page 23). The point is clear–focus on the people who value your time and talent. Don’t stop the train for the nay-sayers, because ultimately they don’t matter. Intrigued yet? I recommend going and picking up a copy of Anything You Want. It’s a quick (and valuable) read. So I have this pattern. I get an idea, implement it and then think “Hey, this is so obvious. Why haven’t I done this before?” Looking back now, I can see that 3 or 4 of these “patterns” have significantly shaped my trajectory through life. No, they haven’t led to personal epiphanies about how to deal with complicated family issues or led me to the perfect parenting principles. But they have led me to make some changes in my work and in my thoughts about work. And these changes have made all the difference. But then I look at these “patterns” and think, these are so obvious. So elementary. How can such “obvious” ideas generate such a fundamental shift in my universe? Thanks to Derek Sivers, I now have a good answer to these questions. But first, let’s examine some of these watershed moments. I was every parent’s nightmare. The bright kid floating through college with a commitment problem. Oh, I could pick a major. The problem was staying committed. And graduating with a degree. My parents went along with this trend for the first 3 years, but eventually they’d had enough. And since I was skating through college on their dime, I can’t say I blame them. So here I was, looking through the student course guidebook for inspiration. (And yes, I’m old enough that the guidebook was a book. No jokes please.) I found a field of study I’d never seen before–technical writing. And I thought, how hard can this be? I can write. I’ll just write about technical things. So I took an introductory class. And the class was easy. Obvious even. So I went to my professor to see what I was missing. Dr. Wilma Clark gave me some of the best (and most elemental) advice I’ve ever received. “If it seems obvious to you, then you’d better do it.” I left her office and declared a new major. Technical writing led me to my college internships and my first job. And it has served as an outstanding foundation for everything that has come later. Even if it did seem obvious. Flash forward 8 years. I’ve been working for an enterprise-resource planning (ERP) software company creating documentation. I’ve created manuals, online help and training guides, but I was getting tired of creating the same content in a variety of formats. Enter JoAnn Hackos and the “new” idea of Single Sourcing documentation. Single sourcing is all about writing content once and re-using at the point of implementation/need. So rather than writing content in book format, write it in granular concepts that can be strung together to create books, online help or whatever else you need. This “single sourcing” principle led me to think about my work differently and connect with others in my field in a new way. And I said – hey, this is easy. Obvious even. With JoAnn Hackos and my mentor Roz Tsai’s help, I started sharing our single sourcing story with others. I spoke at conferences, taught seminars and found a new passion for training and connecting with people. Skip ahead another 6-8 years and I have an idea for using SharePoint in a new way. I want to build SharePoint sites that help people automate their manual processes. I want the sites to rely on SharePoint lists rather than just document libraries. And I start coercing people into going through an information architecture and content review process prior to creating a SharePoint site. All this worked pretty well, but then my boss and I had a stroke of genius. What if we calculated the return on investment (ROI) on these sites? If I looked at how long a process took before SharePoint entered the picture and then looked at how much process time I’d saved with SharePoint business automation, I could calculate how much of a difference I’d made. So I calculated ROI on my first SharePoint project. And it was easy. Obvious even. But after sharing my ROI calculations with others, I discovered how unusual this kind of ROI evaluation was. This video is about me and the way I think. I’m guessing it’s about you, too. Take a look. Want to see more of Derek Sivers’ deep thoughts? Check out his site (http://sivers.org/) or follow him on Twitter (@sivers).